The late Sir Richard Ground was appointed to the JLSC in accordance with section 105(1)(d). Sir Richard served as Chief Justice of Bermuda from 2004 to 2012. Before that he served as Chief Justice of the Turks & Caicos Islands from 1998 to 2004, and as a Judge of the Supreme Court of Bermuda from 1992 to 1998. He began his legal career in private practice at 1 Brick Court, Middle Temple, where he specialised in media law from 1976 to 1983. In 1983 he moved to the Cayman Islands as Senior Crown Counsel, and was Attorney General of the Cayman Islands from 1987 to 1992. 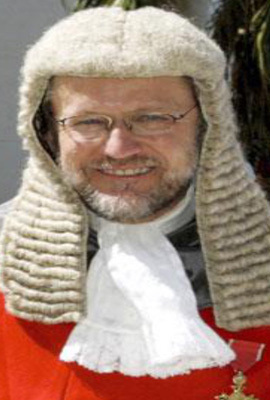 Sir Richard was called to the Bar, in Gray’s Inn, in 1975; was appointed Queens Counsel (Cayman Islands) in 1987; and was awarded an OBE in the New Year’s Honours List 1991 for his services as Attorney General in Cayman. His professional publications include Halsbury's Laws, 4th ed., Vol. 22, "Hire Purchase and Consumer Credit" with Brian Neill QC; Halsbury's Laws, 4th ed., Vol. 36, "Pledges and Pawns"; and he was the precedents editor for the 1981 edition of Gatley on Libel and Slander (Common Law Library No. 8), Sweet & Maxwell, London 1981. He has also published Creator's Glory, a book of photographs of the wildlife of the Cayman Islands; and The Birds of the Turks & Caicos Islands. Sadly, Sir Richard died in May 2014. He served as a member of the JLSC from 1 August 2010 to 22 February 2014.